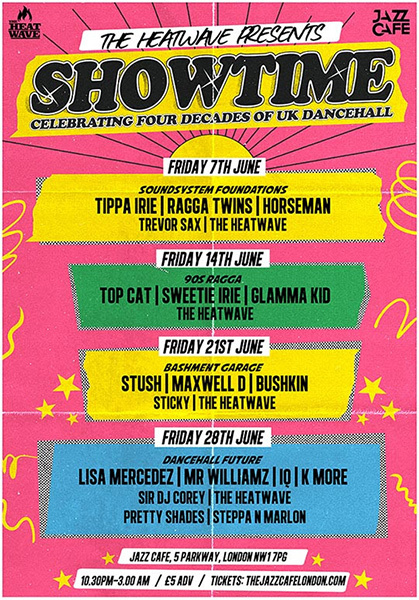 Showtime - Four Decades of UK Dancehall @ Jazz Cafe, London. w/ Lisa Mercedez, Mr Williamz, IQ, K More, Sir DJ Corey + more. w/ Tippa Irie, Deman Rockers + Flinty Badman aka The Ragga Twins + more. w/ Top Cat, Sweetie Irie, Glamma Kid. Victor V + more. 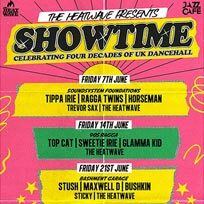 w/ Stush, Bushkin, Maxwell D, Sticky and The Heatwave.